Philip Lane, "The doyen of British Light Music" (James Jolly, Gramophone), has collaborated with Heritage for this Spring release: orchestral music composed by leading figures in the Light Music movement. 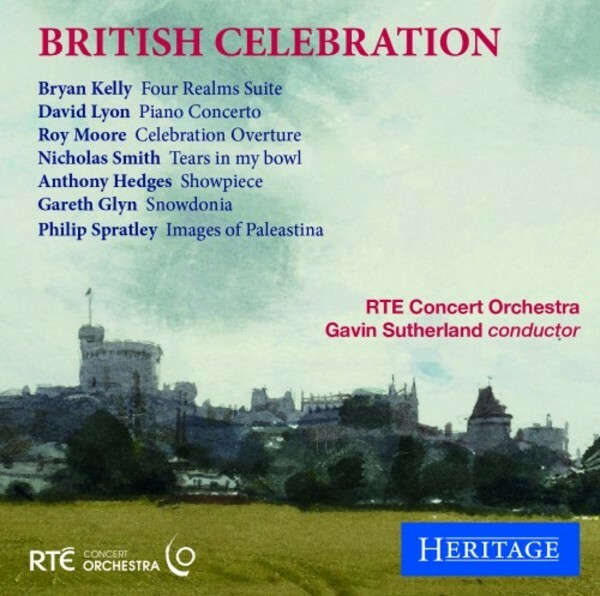 Bryan Kelly was born in Oxford and studied at the Royal College of Music with Herbert Howells and Gordon Jacob, and later in Paris with Nadia Boulanger. His Four Realms Suite won a BBC competition for light orchestral works in 1972. David Lyon studied at the Royal Academy of Music and Bristol University. His Piano Concerto in one movement was written while still a student at the RAM and remained unperformed until 2015 when it was overhauled by the composer. Nicholas Smith's Tears in my bowl makes use of two folksongs from Ningxia, a predominantly Muslim region of China, which date back hundreds of years and have been kept alive by being passed down orally from generation to generation. Roy Moore has worked in most areas of music as composer, arranger, conductor and pianist, with artists as diverse as Madness and Andrea Bocelli. His Celebration Overture was written to mark the birth of his first grandchild, and is suitably joyous. Glyn Jones read music at Merton College, Oxford. His output is prodigious and includes the first Welsh-language opera to have been composed for over a century. The tone poem, Snowdonia, suggests the changing seasons, the grandeur of the area, even the little train that takes passengers up to the summit. Anthony Hedges is most associated with the city of Hull, at whose university he taught for much of his professional life. Showpiece was commissioned by the Friends of the East Riding Orchestras to celebrate the 40th anniversary of their Youth Orchestra. Philip Spratley's Images of Palaestina dates back to the mid-60s when the composer was in the Middle East. The title is the Roman word for the area and is used to stress the fact that the land is home to Arab and Jew.